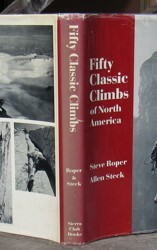 This is the true first printing of FIFTY CLASSIC CLIMBS OF NORTH AMERICA by Steve Roper and Allen Steck. It was published in San Francisco by Sierra Club Books in 1979. It measures 275mm tall x 210mm and has 324 pages, many b/w photos, several maps, bibliography, index. 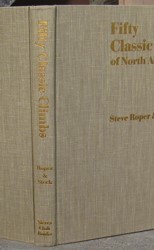 The first printing is the only hardcover version of the book. It is now difficult to find in collectible condition. 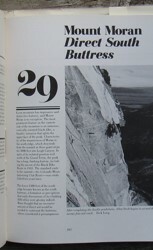 This example of the book has been signed on the title page by Steve Roper, Allen Steck, Jerry Gallwas (made first ascent of Half Dome NW Face with Robbins & Sherrick), Tom Frost, and Fred Beckey. 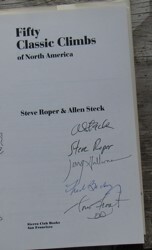 The signatures were obtained by a friend of Steck. All of the signatures are strong and will not fade. CONDITION: Original greyish tan cloth, gilt lettering cover & spine. The book is in fine condition with no marks, no rubbing, no previous owner's name or mark, no writing or marks on any pages (other than the signatures on the title page), no foxing, no folded or creased page corners, clean, tight binding, no fading. Original dust jacket has usual fading to spine, edge wear with small crinkle marks in the vicinity of the edges. Price: $465. 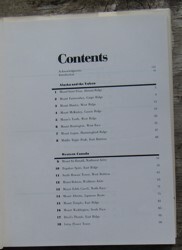 THE PHOTOS ARE OF THE ACTUAL BOOK BEING OFFERED.